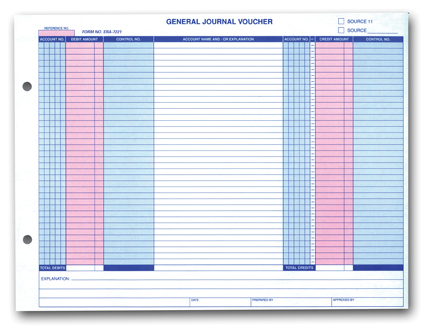 These General Journal Vouchers are designed for use with most computer software systems. Horizontal style general journal format is designed for use with the *ERA & *VIM accounting system. Heavy 20 lb. paper and punched for any post storage binder. 50 per pad. Size is 11”W x 8-1/2”H Packaged 100 per pack. *VIM and *ERA are registered trademarks of The Reynolds and Reynolds Company.